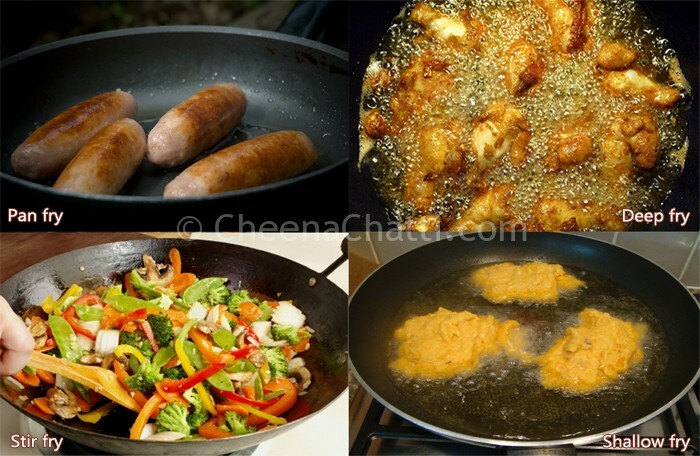 Hope you all know that frying is the process of cooking foods in oil or fats. Wikipedia traces back its origin to ancient Egypt around 2500 BC. In this post, I will cover some of the common food frying techniques and the differences between them. Pan-frying : Its the method of cooking in a very minimal amount of oil just to lubricate the pan. In pan frying, because of partial coverage, the food has to be flipped at least once to get both sides cooked. Usually between every 15–30 seconds. Shallow frying : It is also a high-heat process, promoting browning of the food items. Here the food is only partly submerged about halfway up to the side of the food to be cooked and it must be flipped in between. The advantage of shallow frying is that, it helps to control the degree of doneness and allows you to cook items for longer,by lowering the flame, if necessary. It is usually used to prepare cuts of fish meat, and for fritters. Deep frying : Here food is completely submerged in hot fat or oil. It needs a lot of oil and, ideally, a thermometer also to ensure consistent cooking temperature for even doneness. Because of the high temperature used the food gets cooked extremely quick. Stir frying : A traditional round-bottom cast iron or carbon steel pan called a wok or cheenachatti is heated to a high temperature. Then oil, followed by dry seasonings and the food to fry are added. The food is then stirred and tossed out very rapidly using wooden or metal cooking utensils. Using stir fry, many dishes can be cooked extremely quickly (within a minute). This entry was written on August 1st, 2013 by Jameela Beevi. Posted in Food techniques and was last revised on September 10th, 2013.